NATS Chief Executive Officer Richard Deakin joined Prime Minister David Cameron selling British expertise in handling major events such as the London 2012 Olympics during a trade mission to Brazil. Mr Deakin shared the same platform as the Prime Minister in Rio de Janeiro discussing the transition of the Games from London to Brazil. As a UK-based global air traffic company NATS is already operating in 28 countries around the world providing innovative solutions in the aviation sector as part of its commercial activities. And after an Olympic Games characterised by significant levels of extra air traffic but dramatically reduced delays NATS is perfectly placed to provide advice and guidance to future hosts of the Games. Officials from air traffic control in Brazil observed much of the NATS operation over the three weeks of the Olympics airspace restrictions during the summer as they prepared for Rio 2016. Mr Deakin said: “We spent a long time preparing and planning for the London 2012 Olympic Games and that preparation was reflected in our performance during that period – with considerable extra traffic but reduced delays. “Our internationally-recognised expertise in developing airspace solutions and managing complex and complicated issues, while always maintaining safety as our number one priority means we are at the forefront of planning and preparing for these sorts of events. NATS handled significant levels of extra traffic during the Games in some of its sectors while reducing delays by 95 per cent when compared to the same period in 2011. There was just 593 minutes of delay attributable to NATS throughout the whole of the Olympics. That equates to just 0.1 per cent of the total air traffic delay throughout Europe despite handling 25 per cent of all European traffic during the period. NATS also facilitated the biggest airborne security operation since World War II. The military air traffic control cell operating from the NATS centre at Swanwick in Hampshire provided 24-hour-a-day security surveillance. NATS controllers facilitated the integration of the military operations over London to ensure the minimum delay to civil aviation. Temporary airspace restrictions were introduced in and around London from 14 July to 15 August. A smaller set of restrictions remained in place for the Paralympic Games. 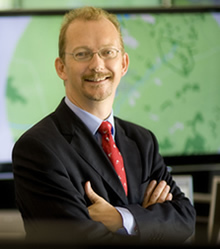 Mr Deakin added that NATS’ position at the heart of air transport planning for London and the south east of England – some of the most complex areas of airspace in the world – as well as its enviable safety record meant it was well-positioned to take its expertise to countries across the globe. “We are predicting double digit commercial growth of our business over the next four years as we continue to provide innovative air traffic solutions to countries in Asia, the Middle East, Europe and the Americas,” he said. “It is a great honour to have been asked to be part of this high profile trade mission to Brazil. This is a key target market for NATS and a doorway into developing business in South America.